We visited the island two years ago and I posted a few images from there, including one of a colorful tidepool. We returned last summer and, without thinking about the previous image, I captured the one below. If you examine the pair, you will see that they record the very same spot. 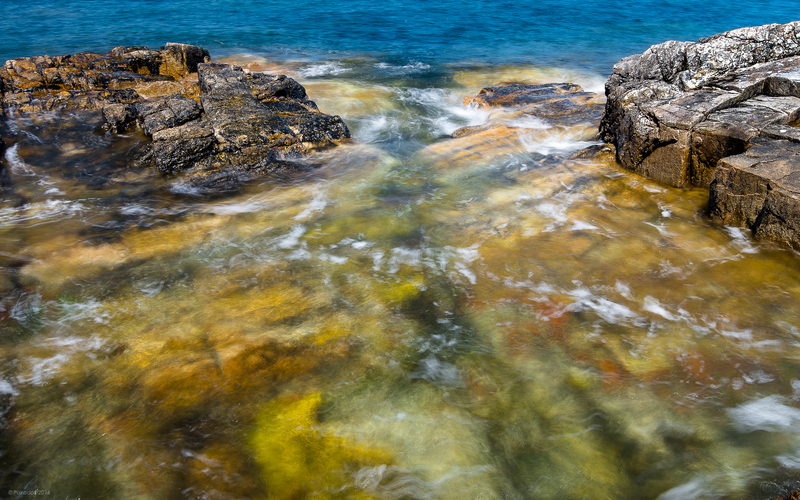 The palette of livings things that inhabit the New England rocky intertidal includes mostly blue and green. Color, in more tropical climes, tends toward red and orange. This difference has everything to do with light attenuation at different latitudes and the scene below might be mistaken for tropical, if not for the depth of the water. Regardless of color, each ecosystem is a thing of beauty to be admired, and protected.